Foundation Services are the first steps in finding individuals experiencing loneliness and enabling them to gain support that meets their specific needs. There are three main aims; identifying and establishing contact with lonely individuals (reaching); drawing out the specific circumstances of an individual’s loneliness and establishing the most appropriate help (understanding); supporting individuals to make use of available services (supporting). Many services can sit across several of these categories. ‘Smart’ home visits: Targeted home visits using advanced data-sharing. Joint Strategic Needs Assessment: Informing local JSNA’s. This template advises how to build a local picture of loneliness/isolation. Sharing data: Particularly useful for third sector organisations who can’t otherwise access this level of data. Agency Based Referral Schemes – existing local service providers train their staff (for example post offices and libraries) to identify older people who might otherwise not have known about/accessed existing services to address loneliness. Agent Based Referral Systems – ‘community’ or ‘village’ agents are paid staff or volunteers working to identify the individual needs of excluded/vulnerable people in a local area. Social Prescribing – primary care services refer patients with social, emotional or practical needs to a range of local, non-clinical services, often provided by the voluntary/community sector. Home from Hospital schemes – hospital staff identify older people who may be experiencing/are at risk of loneliness because of an illness and introduce them to services. The RVS’s ‘Hospital 2 Home’ service model supports vulnerable older adults during and after hospital discharge and offers short-term support. Watch our video on Halton Community Wellbeing Practices (CWP) which works with 17 GP practices to identify and support thousands of patients. 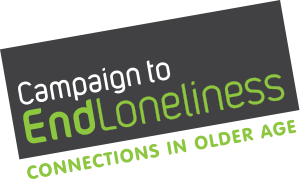 Older people experiencing/at risk of loneliness can be targeted through leaflets distributed via supermarkets, GP surgeries etc, direct mailouts/local magazine articles for the less mobile and radio/television coverage. Local commissioners should employ identification strategies that complement existing activities/relationships in a local community. For example, distributing a loneliness questionnaire through local pharmacies to increase referrals to a local charity service. See Hidden Citizens, by the Campaign to End Loneliness for a detailed exploration on identifying older people experiencing loneliness. Once an individual experiencing loneliness has been reached, Foundation Services must understand their specific needs to ensure that any intervention is personalised and appropriate. A relatively unstructured engagement with an older person exploring their circumstances, needs and wishes, leading to a discussion about available services to improve their wellbeing. These in-depth discussions are vital in ensuring someone’s needs are recognised and responded to. The stigma attached to loneliness can be a barrier to an individual asking and accepting help. Services and commissioners therefore have a choice to make about whether to mention the ‘L’ word when addressing an older person. But either way, existing points of contact with older people need to make time to have an open conversation, in a safe environment, about how someone is feeling – and what support they might like. Disabilities and sensory loss are major risk factors, and accessibility must be factored in understanding the needs of older people experiencing loneliness and referring them onto to accessible services. For example over half of those using any service for older people are likely to have a significant sensory loss. Therefore to be effective all older people’s services need to take account of this – sensory impairment should be a mainstream part of supporting older people. Providers tendering for contracts or frameworks should be asked how they address sensory loss, including if their staff are trained to identify and support those with sensory loss. Sight loss – 1 in 5 people aged 75 plus and 1 in 2 people aged 90 plus and over are living with sight loss. Hearing loss – More than 70 per cent of people aged 70 plus and 40 per cent of people 50 plus have some form of hearing loss. Dual sensory impairment – There are currently 356,000 deafblind people in the UK and this number is set to increase by 60 per cent to 570,000 in 2030 with the over 70s most affected (they will make up 74 per cent of Deafblind people in 2030). Sense also offers a variety of courses to equip health and social care professionals with the tools and skills needed to be able to identify and support people with dual sensory loss. They offer courses specifically on working with older people with dual sensory loss, which include access to their Sense Sensory Impairment Monitoring Scale, an easy to use tool in identifying and monitoring changes in hearing and vision. Visit their website here. Loneliness can have a damaging effect on a person’s confidence, limiting their willingness to engage. Once an individual has been reached they may need support to reconnect with their community/existing services. This may include linking them with a trusted buddy or mentor who offers support to achieve specific goals, or takes them to activities. This response is not another befriending approach, but facilitates access to direct interventions. Usually time-limited and goal-orientated, this allows a greater throughput for the same resource as a basic befriending service. Sense report: A Right to Friendships?